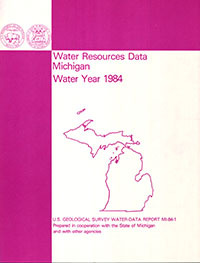 John B. Miller, John L. Oberg, and Theodore Sieger Jr., 1985, Water resources data, Michigan, water year 1984: Water Data Report. Water resources data for the 1984 water year for Michigan consist of records of stage, discharge, and water quality of streams; stage, contents, and water quality of lakes and reservoirs; and water levels and water temperature of ground water. This report contains discharge records for 142 gaging stations; stage only records for 2 gaging stations; stage and contents for 5 lakes and reservoirs; water quality for 27 continuous-record stations; and water levels for 53 observation wells. Also included are 56 crest-stage partial-record stations and 22 low-flow partial-record stations.A Additional water data were collected at various sites, not part of the systematic data-collection program, and are published as miscellaneous measurements. These data represent that part of the National Water Data System operated by the U.S. Geological Survey and cooperating State and Federal agencies in Michigan. John B. Miller, John L. Oberg, Theodore Sieger Jr.